Giving out gyan and putting it to use when the situation commands are two different things. I realized this last weekend. About 2 years ago, I had published this post, wherein a Toyota Fortuner was stuck in muddy waters outside MMSC in the outskirts of Chennai. [Read and view it here] After entertaining the onlookers for over 30 minutes, after getting help from many people and trying several tricks, finally they pulled out the vehicle and drove away. Last weekend, we were driving towards Kabini. We saw a waterbody (Nugu Reservoir) and a mud road going closer to water. We left the main road and drove close to water. I stopped at a safe distance away from water, clicked a set of photos and all was great at this moment. One of the team members encouraged me to go little further, saying “little bit of mud would look great in photograph”. With the confidence of few previous mild offroad experiences, encouraged by the participants, I threw away my otherwise cautious hat and drove couple of feet further. Below: After going "a little closer"
Then the unthinkable happened. Three wheels sunk considerably in mud and other one partially. Only 1 wheel was over the ground. With the hope that this is nothing for Tata Safari, “The Real SUV”, I engaged 4H and tried pulling the car out. But the wet surface and mud didn’t offer any traction and wheel only sank deeper. We tried one more time, by putting some small/medium stones under the wheels. But this was of no help. The over weighed SUV managed to bury the stones in mud and stood there smiling as if nothing has happened. 6-7 people trying to push the vehicle also had no impact. Our next option was to deflate the wheels and try again, or get some planks to put under the wheels, before sending out distress calls. Thankfully, a tractor was nearby. They were filling water into the tanker. Tractor guy offered to help. A steel road was used to tie the tractor and Safari. In first attempt, the rod came off, since the lock was inadequate. We tried one more time with better interlocking and this time, safari was pulled out easily. 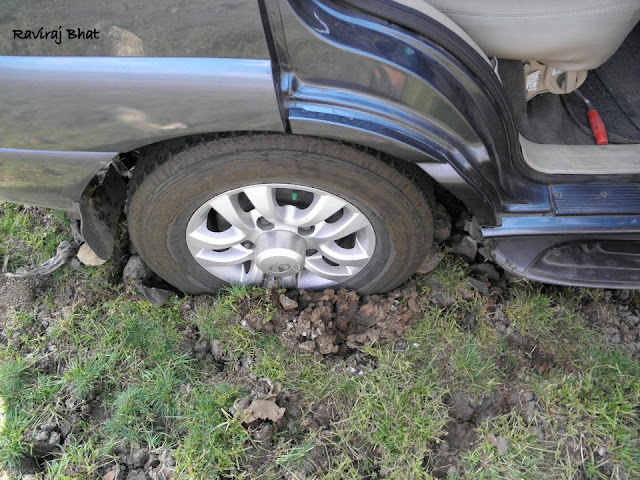 · Weight of the vehicle can be the biggest spoilsport during off-roading. A light vehicle can easily clear a muddy path while heavy vehicles would sink. · 4x4 s are not invincible. They’re good ego boosters, but doesn’t guarantee performance. Half of it depends on good driving skills and other half on being able to make right judgment of the situation. Drivers should be aware when to take risk and when to play safe. · Without support/backup, life could be miserable if you allow over confidence to take over. Later during the trip, we didn't hesitate to get off the road, but were far more cautious. Now looking at the images, I felt it was too simple a situation. We should have managed to pull out the vehicle. Availability of the tractor nearby played spoilsport, as we didn't attempt much and sought his help instead. If only that tractor was not present, we would have experimented more and learn more tricks. That kind of disappointed me too; that was a muddy rescue! Try carrying chunks of flat wooden boards. Works like magic in the sands. Try using the so called floor mats for traction, might help!? Reginald: I doubt, because wheels can easily push the mudguard under the mud.